You aren’t reaching high enough if the future is known, the path is clear, and outcomes are certain. But navigating ambiguity drives most of us nuts. All important decisions have alternatives. This is doubly true when decisions are personal. Fear the other path might turn out better. Concern for hurting those negatively impacted. Anxiety about jumping from the pan into the fire. You don’t want to make things worse. Dread that new information might emerge. What if a better option appears and it’s too late? Examine options through the lens of your strengths. Talk it over with others. Some decisions are foggy even after employing the above considerations. Sometimes the more you consider, the foggier you get. If both alternatives fail, which will you be glad you tried? If both alternatives succeed, which will you be glad you are doing? I just talked with Bob Hancox. He offered these suggestions if you’re at a fork in the road. If you have several alternatives, try putting them in one of three buckets. Good. Better. Best. How do you make decisions when you’re at a fork in the road? I try to consider the hard data–the numbers, facts etc. and the soft data-how I feel about each option. What my gut is telling me. Also, I try to talk with others who have faced similiar decisions to get their insights as to how to weigh the options. “Defining moments” reveal our true beliefs and values. Thanks Paul. Your last sentence is amazing. It’s true that these moments help us better know who we are and what we believe. Sometimes we don’t realize what we believe until we have to make an important decision. Then things get real. When faced with hard decisions I often tell people to think you are on the edge of a high cliff and looking down. Think of the worst thing that can happen in this scenario and face that. For example you are buying a house and not sure you should complete the deal. The worst thing is losing your whole escrow deposit. By facing this and accepting that bad possibility, you should be more able to deal with less severe outcomes. Thanks Brad. There’s something great about imagination. It seems to lift us out of the weeds. Brilliant… What’s the worst that could happen? Face that and see how it impacts your decision. Great post… I could totally geek out on decision-making research! Having them visualize the scenario often helps eliminate options and point you towards ones that are likely to play out better. Thanks Lesley. YES! Play it out before you make the final decision. It’s interesting to listen to those conversations. 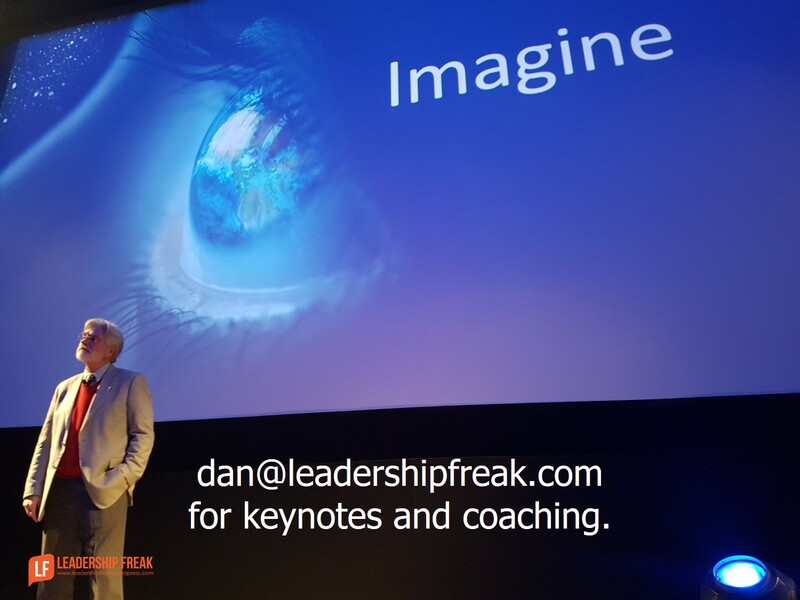 People reveal their values, concerns, and vision (if they have a vision). Another thought process Russ Ackoff taught me with forks in the road. Answer this question, “Where do you want to be NOW?” Then work yourself backwards to where you ARE now. Look through the people’s eyes that might be impacted. How would they answer these questions? Most people recognize tough choices have to be made and not everyone will agree. It is only the questions we ask, carry us to our destination. Draw the options out on paper. When in doubt go with your instincts, granted not every fork has equal value. Determining whats best comes from you, yes perhaps others may have the solution for them buts your could be different. “Nothing ventured nothing gained”. For as long as you have picked yourself up in life, you know you can do it again! 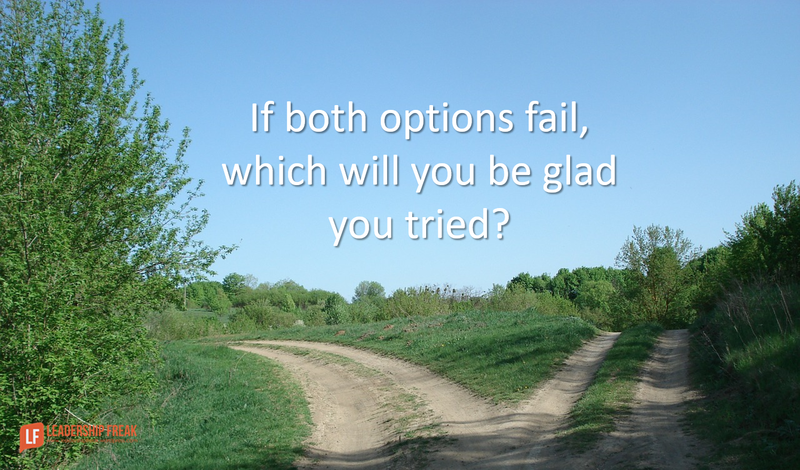 I love that question, “If both alternatives fail, which will you be glad you tried?” Wow! That opens up an entirely new dynamic of looking at the choice. I’ll be asking that in coaching conversations in the future. Thanks. ALL of your posts are well worth reading, but some are “keepers.” It certainly will help with big decisions, but I also think that the questions can be applied to the smaller, daily and weekly choices that we make.